The Sprinklesmobile is coming to town. The cupcake trend hasn't bombarded San Francisco quite like it has New York and Los Angeles, but next week, heavyweight Beverly Hills cupcakery (and place of really long lines) Sprinkles will make its first San Francisco appearance ever in the form of the pictured Sprinklesmobile. 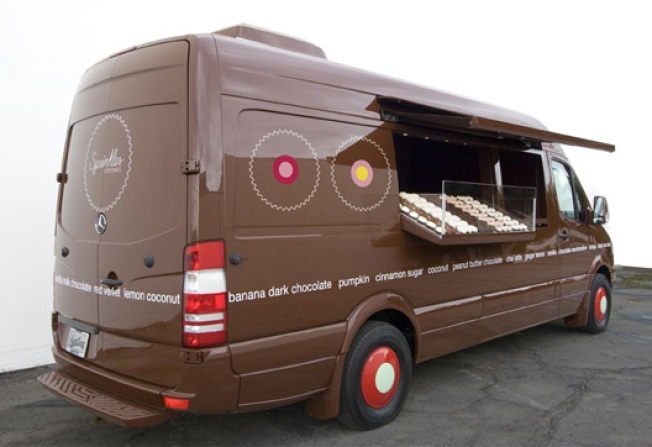 The cupcake truck will drive up from Los Angeles to troll around the Bay Area for a few days. Currently the cupcake makers have a home in Palo Alto. Next Monday, from 11 a.m. to 5 p.m., Sprinkles will be selling fresh cupcakes (including the famous red velvet one) in conjunction with KGO's San Francisco Food Bank Drive, donating 100 percent of the proceeds for that cause. The specific stops aren't set in stone yet, so you might want to keep on eye on the source, but word on the street is that next Thursday will see a stop at Twitter's SoMa HQ. Brace.